"Well written with a different slant on zombies. Characters are likeable and not totally predictable. Made me want to pick up book 2. I enjoyed reading this book. It had a variety of interesting characters and a good, strong story. The location was very eerie though and those 'thinker' zombies are a bit scary." 4.0 out of 5 stars Thinking Zombies??? In a genre that is overflowing with books, it's often hard to find one that is unique. In "Sleep, Think, Die", I think that I have found the beginning of a unique entry. At the start of the book, Carson is fighting for his life against an atypical zombie, one that appears to be able to think. He is rescued by a strange quartet made up of two former bouncers, a common man and a young woman who appears to be afraid of her own shadow. Carson has dubbed these more intelligent zombies "Thinkers", which seems to be an appropriate moniker since they appear to reason, hunt, and think about their next move. There is plenty of action and gore, but not so much that it becomes a total gross-out. The premise of how this particular zompoc might have started is fairly unique (at least IMHO) and added a lot to the story. The characters became more fully developed as the story progressed and I found myself shedding a few tears along the way as some of them lost their battle against the zombies. I look forward to continuing this series and think that it will become one of my favorites. the author started the book year or so after the mystery zombie outbreak. we do get to know more about the virus, how and where it all started. We follow small group. some awesome and weird fake names ever! I also liked how the author didn't hold back killing people off even how much you love them. I love that!!! Pretty good zombie book. There were quite a few errors which drove me a little crazy. Might be because I got a file from author. This was a little different from your average zombie book. There were smart zombies, called Thinkers. I liked the main character Carson, I even ended up liking Lavender. Zombies and gore what more could you ask for? Formatting and editing were both above par and consistent. Would recommend! A VERY GOOD BOOK, I LIKED THAT IT HAD A REASON FOR THE ZOMBIE APOCALYPSE RATHER THAN HAVING NO REASON FOR IT. I'LL DEFINITELY BE GETTING PART 2. 5 out of 5 stars Good read! Inventive story with great characters. Really enjoyed this story and the characters. I'm a big fan of the genre and like the author's handling of the inevitable gory scenes. There are good simple descriptions without going overboard. I'm looking forward to the next book in the series. I enjoyed this book very much. It's a fun romp through the zombie apocalypse with some interesting characters. The thinker zombies aren't what you're used to, and they make for some interesting developments. I really enjoyed this book, it’s nice to see how different authors put different twists on the zom poc. If you like apocalyptic stories and zombies then this is definitely worth reading. Looking forward to next book." Thank you to the reviewer, P.S Winn. "4 out of 5 stars Great action and dialogue in a different type of zombie read. Interesting read and for a longer story it goes by quickly. I am not really a zombie fan, but the author has taken your normal tale of the undead and added a twist. When Zombies invade it seems the living being smarter would have the advantage, but what if that wasn't quite the scenario. What if the undead still carried a bit of intelligence in those brains thought empty? People, like Lavender, Bumper, Gasher and Carson are going to find out.The author has written an action packed story but this novel is more than that. This novel will make you wonder what would you do and maybe be a help when those zombies enter your world." 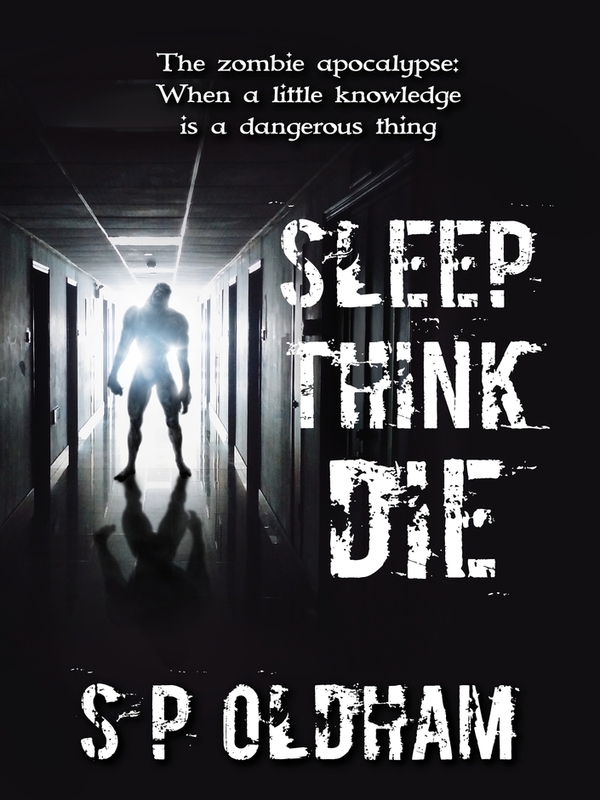 Thrilled to get a five star review for 'Sleep, Think, Die.' Thank you so much to the reviewer Sgtivypieon, not just for buying and reading the book but for taking the time to review. Thank you. I read a lot of zombie and post-apocalyptic fiction and they can very easily become either extremely gruesome or too detail heavy. However, this new book by SP Oldham is very well written and sits nicely in the middle of the road making this a very enjoyable and easy read. I would find myself looking forward to jumping back into the action with the characters and wondering what would happen next which is always a sign of a great book. Set in the UK so is a bit more relatable for us UK readers. A unique twist on the zombie genre with intelligent zombies that will keep you on the edge of your seat. I'm really looking forward to the sequel. Well done to the author!! A great review left for 'Sleep, Think, Die' on Amazon today. Thank you so much to the reviewer, Nat 87. 5 out of 5 stars "Excellent read! I read a lot of post apocalyptic and Zombie books and this one is up there with the best. The characters are great, the narrative fast paced and the zombies well written (although gruesome as expected). I particularly like that's uk based so there are less guns and ammo, but more creative ways of dealing with the zombies. I have finished the book with the need to follow up with book two, so wait in anticipation of the sequel!" HOLY CRAP! I really enjoyed this book. My favorite characters were Lavender Gin and Bumper. Lavender Gin seems like a DUMB BLONDE, in the beginning, hiding under her boyfriend's corpse but then proves herself useful throughout the entire book. Bumper, I just loved him since he first showed up in the book. I loved the take on the Thinker zombies in the book. It was a great twist to the regular boring zombies you see on TV. I say great job to the AUTHOR. I loved this book! Can't wait for the next one. By the end of the book, there are some you hate to see die and others you hope will. I would suggest this book to any zombie lovers out there. About the book: The dead are beginning to overrun the living. They walk side by side. Is the world over? Can things be saved? Review: I’ve read a few of the author’s other works but they were shorter. However, I think I enjoyed this one more because it was longer while at the same time still being to the point without all the unnecessary filler. I would definitely recommend this to those who like supernatural. Stumbled upon this book and glad I did. It is not your normal zombie book and worth reading. Another great book by S P Oldham and one which I thoroughly enjoyed. I have watched many a Zombie movie, but I cannot recall that I have ever read a Zombie story before. If all Zombie books are as good as 'Sleep, Think, Die', then I will be wanting to read more. I am not going to spoil one's enjoyment by writing about the story, but I do recommend this book. I would like to thank the author for sending me a free copy and this was my honest review. Five Star review from Liz Llewellyn: "Well, what can I say? I have read Wakeful Children from SP Oldham and really enjoyed it so as I'm a big fan I had high hopes for this book. I enjoy this genre of books and have read many different authors and I can honestly say this was BRILLIANT! A chance encounter with 4 ragtag zombie killers saves Carson's life and changes it irrevocably. Throughly engrossing with a fast paced narrative which pulls you along to the end. I can't wait for a sequel ( hint hint SP Oldham) as i want to know where the story , and Carson, go from here. Cannot recommend highly enough." Five Star review from 'Katie:' "Engaging story, beautiful characters, Awesome new twist on Zombie story. highly recommend it!" Four Star Review from Aly:"This book was more exciting and more fun to read than I thought it would be. I don't read tooo many zombie types books but the ones I do read are ok. This one was better than ok. I enjoyed the names of the characters some unique ones! I think this book had a great idea about zombies too they had "Thinkers" in this book that was a new twist for me. Great book..."